Weekend Assignment #205: As of 2007 Americans owned over 72 million dogs, and over 81 million cats. They also owned horses, birds, fish, turtles, ferrets, lizards and other critters. (Real statistics can be found here.) My question is this: what pets have you had, other than a dog or cat? Is there some kind of pet (allergies and zoning ordinances permitting) that you'd like to have? Extra Credit: Are you more of a cat person, or more of a dog person, both or neither? Somewhere in this room was a 10 gallon tank. My dad is highly allergic to dogs and cats, and I'm highly allergic to cats, birds, guinea pigs, rabbits, horses, and probably several other species. Although I lobbied for a Mexican Hairless, there was no way that house in Manlius was ever going to have a dog or cat in it when I was growing up. But my parents, bless 'em, did come up with consolation pets from time to time. When I was little, my brother Steve had a succession of parakeets: Petey, Dewey, Dewey Two, and I think Frisky. Then one year on her birthday, my mom bought me a parakeet, which I named Friskyblue. By the time Friskyblue died, I was in fourth grade, and had been tested for allergies. Feathers were on the long list of allergens that got a reaction on the scratch test. So: no more parakeets. Then my dad brought me home a goldfish. I was so delighted that he snuck two more fish into the bowl a week or two later. A week after that, we were trying to keep the poor things from suffocating; the unaerated fish bowl just wasn't adequate. When the last of the goldfish died, we went down to Exotic Tropical Fish in DeWitt and did the fish thing properly: a ten gallon tank, with gravel and filter and demineralizer and heater and live plants and a ceramic decoration and guppies and mollies and swordtails and zebra fish and a corydoras catfish and a pair of kissing gouramis. The kissers were my favorites, by far. Of all the fish in the tank, they came the closest to having a personality, and to interacting with humans beyond merely chasing the fish food. They also survived for years and years; at least the one called Kisser did. Somewhere in junior high or high school I somehow ended up with a turtle, for about a day. I may have traded with a friend for it. But I had tropical fish from fourth grade through my freshman year in college. What put an end to that run was my moving onto campus when my parents got divorced. The dorm had a no pets policy, and although I defied it briefly, it quickly became clear that fish in the dorm room weren't very practical. So we got a gerbil instead. Eowyn would occasionally get out of the cage and run around the dorm room, but my roommate Evelyn and I weren't terribly concerned. Usually I would catch it in the closet a few minutes later. After a few months of this, I discovered that Eowyn had chewed up about eighteen inches of my junior prom dress. If I had no allergies, I think the only pets I'd want now would be a horse and a parrot. I'd get them at least partly for research purposes. There are lots of horses in the Mâvarin books, and King Jor has a parrot named Skwok. Knowing more about real horses and parrots would probably be helpful, and I expect I'd love the animals themselves. Also, they're relatively long-lived species, which would be a comfort. Oh, and on the extra credit, I think you know the answer, don't you? 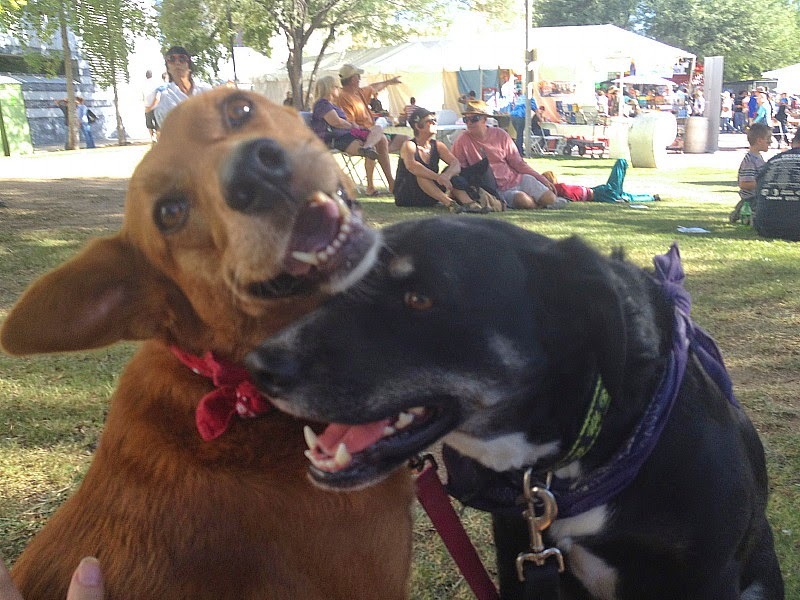 Your turn: tell us about your non-cat, non-dog pets, past or present, actual or desired. Write about this in your journal or blog, and come back here and leave a link to your entry in the comments to this one. Next Thursday night I'll do my usual roundup of everyone's responses. Sound good? Then go to it! Becky: "Maybe some people have a year that pops instantly to mind, but most years where the greatest events of my life happen; the worst events have also happened." Saqib: "However if I were to mention a remarkable year that I had it would be the year 2000. 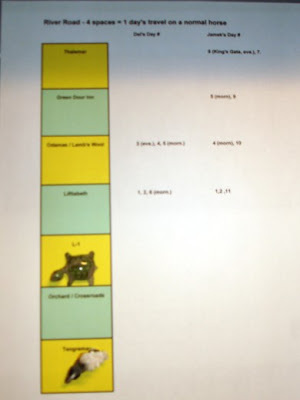 This was when I was in high school taking some of my very first computer science courses." Arachne Jericho: "There’s a reason I’m a here-and-now kind of person: after 20 years of hell, every year of my life has simply been getting better." Mike: "I'm going to go with 2000. I finished my return trip to school about 18 months before, we both had good paying jobs, and we went to Maui. The trip itself made the year." Florinda: "My favorite year of the 21st century - so far - was easier to pin down; 2006. The excitement began on February 5th, when my (second) husband (to be) proposed to me at sunset in Stearns Wharf in Santa Barbara, California." Kiva: "For me, the past is a learning experience upon which I base my future. ... There have been exciting travels and horrible sicknesses, new jobs and layoffs. I don't think I ever had a year that wasn't bittersweet." Gee, I didn't mean to traumatize anyone! A more lighthearted Weekend Assignment - I hope! - is coming right up! 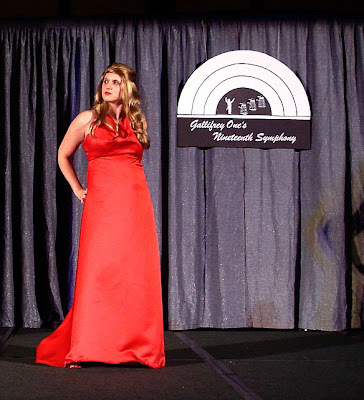 Right, where was I in my painfully slow recap of Gallifrey One's Nineteeth Symphony, Opus 2008 (the con's full name)? 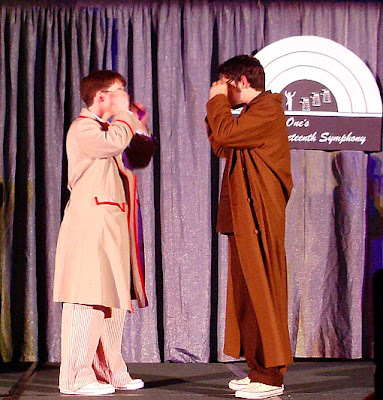 As I look back on my entries labeled Gallifrey One, I see that I didn't even write up the stuff from before the Masque of Mandragora except for the briefest of summaries written that Friday night. The problem with not posting full details as they happen is that memories get garbled after a while. Was the VotD screening on Friday or Saturday? (Friday.) Was the Buffy singalong on Saturday? (Yes.) And so on. Okay, then: once I got to the right hotel and checked in, I managed to cram in a number of events that day. From here on out I'm going to crib from my program book, Lee's con report and my own posts made at the time. At 4 PM was Gary Russell's interview of Sylvester McCoy and Sophie Aldred, after which I left the main room (which had composer-archivist-restoration specialist Mark Ayre's presentation on Doctor Who) to rush upstairs for things to be autographed. That particular autograph session was largely writer-oriented, and so I got to say hello to Steven Moffat (who jokingly characterized himself as "a disappointment" in person), story editor Andrew Cartmell (who presided over some of my favorite 1980s stories), Andy Lane (whose New Adventures novels I had foolishly left behind at home), Paul Cornell (who remembered my comment on his blog about John Lennon and Paul McCartney), and James Moran (whose interview in Doctor Who Magazine was in one of the issues I left home). Still, it was pleasant to get a quick chat in with each of these guys, especially once I tracked down my well-thumbed copy of the Discontinuity Guide, co-written by Cornell, which I had been reading over lunch at Carl's Jr.
After that was Opening Ceremonies in the main room. I was a million miles from the stage, but that didn't dim my appreciation as emcee Shaun Lyon introduced the weekend's guests. Steak salad in the sports bar. A break in the schedule of must-see events followed, which gave me a chance to have dinner with some of the fans in from Phoenix, including the marvelous Lee Whiteside. 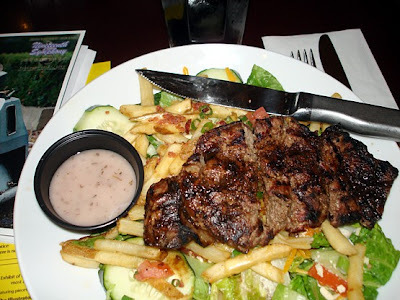 I had what sounded like a relatively healthy and intriguing menu option, steak salad. This turned out to be a salad with french fries dumped on top of it, and a steak on top of that. It was good, though. The Doctor faces "Evil Toby," which didn't happen in the story. This brings us up to the Masque of Mandragora, which I've already covered in some depth, except that I've found some more pictures I failed to post before. Here they are. My post the other night ended with the Just a Minute game, except that I totally failed to communicate how fun and funny it was. Great stuff, and that's all I'm going to say about it tonight. Some of it was supposedly available online as of last week, but appears to have been taken down now. After Just a Minute on Friday night, prize certificates (and some actual loot such as gift certificates) were handed out to about half of the costume contestants, some of them very specific to the individual's costume. Cassandra and her "boys" took Best in Show, and I remember Martha and the Cyberboy being honored as well. 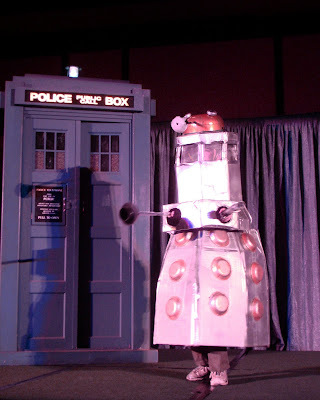 This was followed by screenings of "Time Crash" (Moffat's charity piece featuring the Fifth and Tenth Doctors) "Voyage of the Damned" (the highly-rated 2007 Christmas special) and "The Infinite Quest" (an animated adventure that was originally serialized on the BBC kids' show Totally Doctor Who, with Tony Head voicing the main villain). None of these have officially been aired in the U.S., nor released on video. 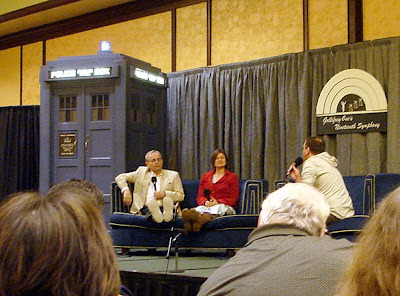 Nevertheless, most of the fans at the convention had already seen them, including me. But seeing them on a big screen with a bunch of other fans was a rather different experience than watching them alone on my laptop! 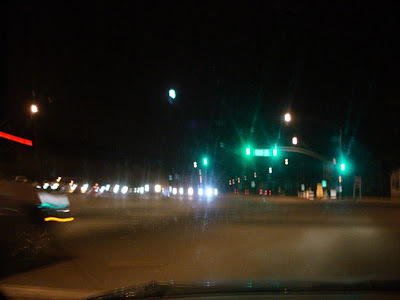 I was up late Friday night blogging, which made it a little hard to get up the next morning. But Saturday was a full day of stuff to write about, so I'll leave that for another time. Nearly two months after leaving AOL, John Scalzi continues to inspire the creative efforts of others. No, he's no longer doing the meme-with-links-to-your-blogs thing; he's passed the baton on that (*ahem*). But over in his blog Whatever, he frequently tosses out an idea for a fun activity to keep his large readership amused. 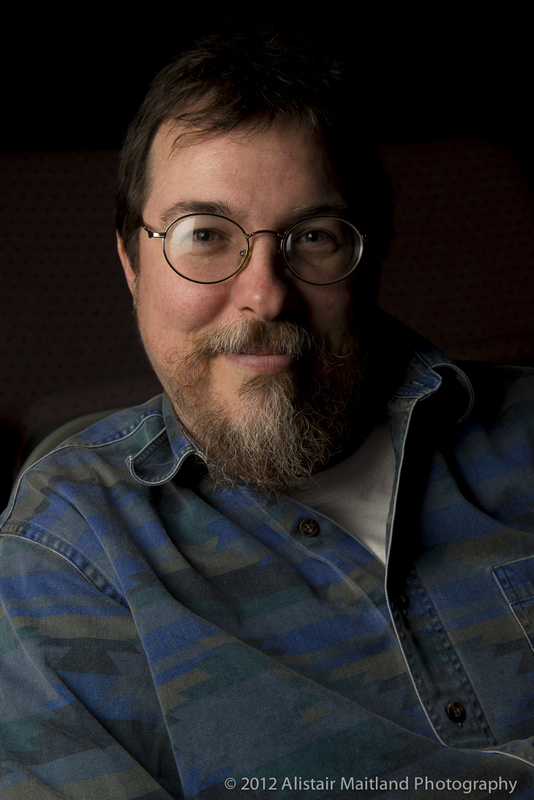 Back in January, for example, he parlayed a typo into a writing prompt, "I Met John Scalvi," and encouraged readers to describe their encounters with this fictional person. Other times he's set up a premise for readers to turn into posters and lolcats and such. And today (okay, yesterday), he declared it to be "International Make Up a Word Day." Awakested - simultaneously too awake to go to sleep, and too sleepy to accomplish anything. 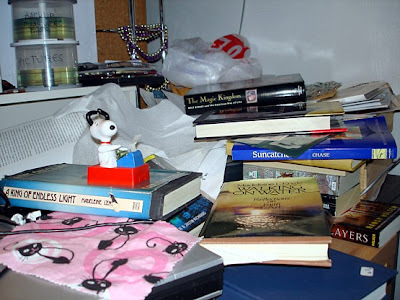 Bookcreep - the stealthy migration of books from the shelves where they belong to untidy piles all over one’s desk. Also called pagigration or librigration. And of course I had to mention my husband's word, inanimosity, which refers to the hostile behavior of objects. I find it a very clever and useful term, and promote it at every opportunity. Calibording - stopping at a booth near the Arizona - California border, ostensibly to reassure the state that you aren't importing ferrets or insect-infested fruit, while undergoing profiling as a possible illegal alien. That's enough for tonight. I got a nap earlier, but that doesn't mean I should stay up for another hour, making up words! 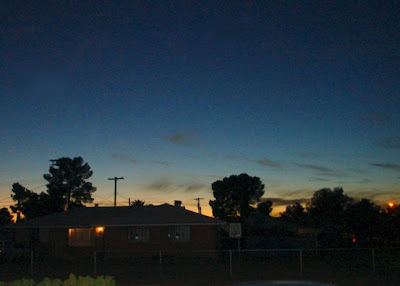 I'm trying to fight my dawntending, the process of going to bed later and later until all sleeping is done by daylight. That's a word I came up with over 20 years ago, when John and I shared a single Mac SE, and my sleep schedule was even screwier than it is now. And tomorrow I'll emipagigrate those L'Engle books, I promise! I've dawdled my way to (almost) 1 AM, watching Doctor Who and two episodes of the British series Primeval (one of them by Paul Cornell), refreshing my memory about the end of a L'Engle novel, reading a Thurber pastiche about a candidate for the SFWA presidency and learning why John Scalzi and others say our current President of the United States is only the second worst one ever. (Sure. Go ahead and follow all those links, especially if you're a science fiction fan. The rest of this entry will still be here when you get back.) What I've accomplished by all this, of course, is to give myself an excuse to fob you off with a photo essay tonight instead of writing a lot of those word thingies. There are only two people in this shot, which I've cobbled together from three different photos. 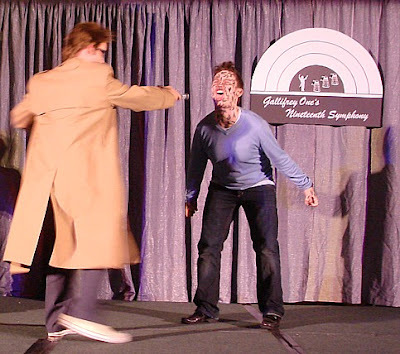 It was a quick change act, with the guy acting as a human wardrobe for the woman. I'm not sure all the costumes were very successful, but it was a very ambitious and interesting attempt. Somewhere in there was also a guy dressed as Benton, and possibly one or two other entrants, but I failed to get usable photos. Here's another composite shot, this time of a truly awesome recreation of the Tenth Doctor's recent companion, Martha Jones. 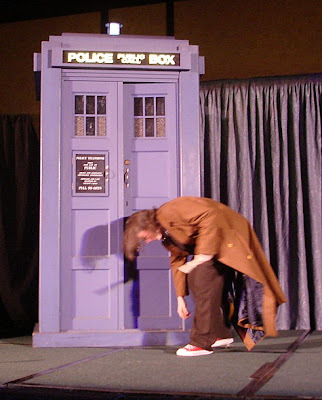 And finally, here's another Tenth Doctor, trying to break into his own TARDIS. 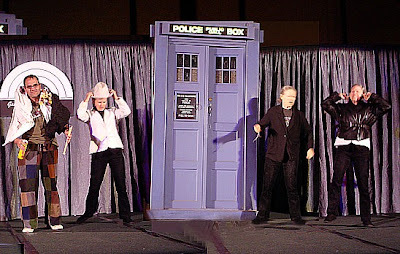 Looking at the shots from Friday night, I'm 80% convinced that the fragile TARDIS prop was a little lopsided that night from being handled too much by the day's guests and costume contestants. 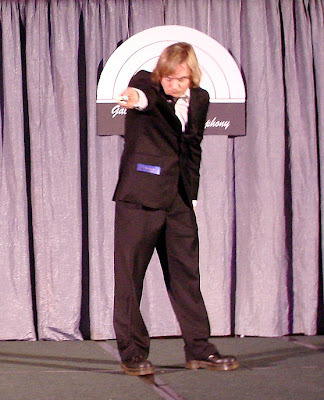 The plan was to have writer Paul Cornell host a game show called Just a Minute while the judges did their judging. However, when all the people in costume had paraded across the stage, Cornell and his contestants weren't ready yet. Nobody really minded, though, because Tadao Tomomatsu and Patrick Beckstead of the con committee did a fabulous job of entertaining everyone while we waited, even performing to the classic Muppets tune Mahna Mahna (a.k.a. 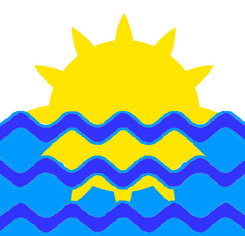 Manamana). Tomomatsu also did a flawless impression of Satchmo singing What a Wonderful World, the classic song that closes the Hitchhiker's Guide to the Galaxy tv series. 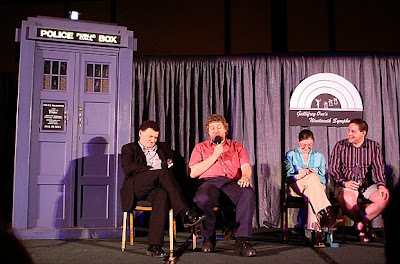 Paul Cornell (in stripes above) then presented his version of the longrunning BBC Radio 4 game show Just a Minute, featuring (left to right) writer Steven "Two Hugos" Moffat, "Dalek" writer Rob Shearman, Torchwood/Doctor Who writer James Moran and actress Sophie Aldred. (The woman next to Cornell above is keeping score.) Somehow I didn't manage a good shot of Sophie in the game, which is a shame because she won. The premise is to speak for a full minute on an assigned topic "without repetition, hesitation or deviation," with other contestants winning points for challenging the speaker when he or she commits one of these errors. The catch is that the successful challenger then has to take over speaking on that topic. The topics, such as "My Volcano," "My Dalek" and "Are You My Mummy?" were all tailored to the individual contestant, and the funniest bits tended to come when someone else took over a topic. Lee over on sftv blog has a good rundown of the highlights of the game, and it's nearly 3 AM so I'll stop here for now, and bid you good night. New Monday Photo Shoot #9: Even though we often get the time from our computers and cell phones these days, nearly everyone still has several clocks in the house. There are also lots of memorable clocks out there in the wide world. From historic clock towers to the smallest travel alarms, let's see some interesting clocks! As some of your know,we generally go for a midcentury modern aesthetic around here (think fun 50s and early 60s). 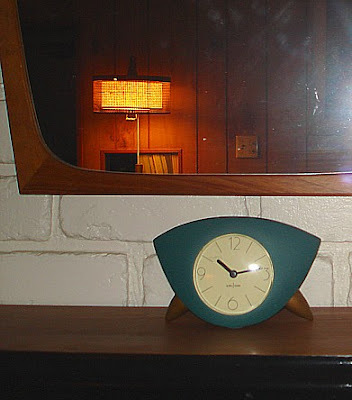 John has picked up several vintage clocks over the past decade to go with the rest of our decor. This little green clock isn't one of them. It was brand new when John got it several years ago. Nevertheless it has a midcentury look to it, from the odd shape to the pointy legs, the non-digital face to the teal green body. It sits in our den under a vintage mirror with a similarly unusual shape. And if you don't think the shape is odd enough already, we can certainly fix that in the edit! see its twin online in the early days of eBay, getting bid up into $500+ range. Or was it $5,000+? I forget. Either way, it turned out to be a scam, with a shill bidding to drive up the price. The auction was ultimately canceled. 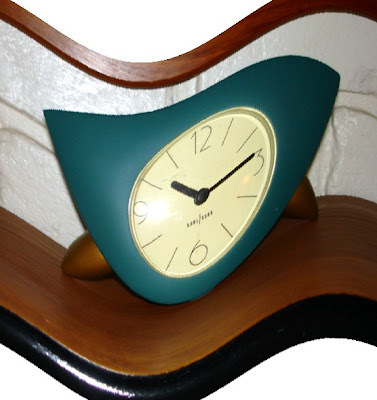 The really valuable clock in this general style is probably the Herman Miller ball clock, which is more atomic than sunburst. 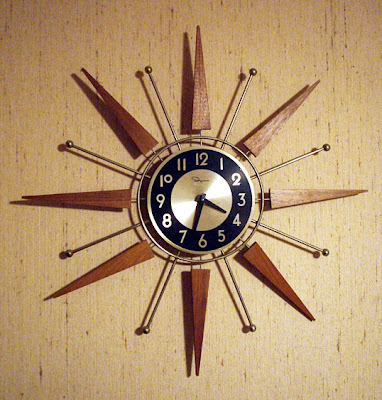 The kind we have is more of a cheap, mass-produced cousin to the designer clocks of the era. Our particular clock has not kept time well since we got it, so we eventually let it run down. Still looks good on the wall, though. Your turn! 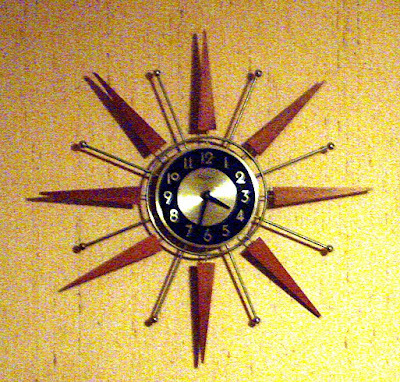 Find us one or more cool clocks to look at, post the photo(s) in your blog or journal, and then stop by here with a link to the entry. But hurry: the clock is ticking! You only have until Sunday night, March 2nd. That's when I'll compile the roundup of entries and link back to everyone so people can see them all. And please do link back here in your entry as well. I've had a few cases this week in which someone didn't link back here, or didn't leave a comment here with their own blog address, or both, which made it a little harder to share the linking love. Remember, a major purpose of memes like this is to help people discover each other's blogs. Please help us do just that, by posting those links! Monday Photo Shoot Results: Are We Relaxed Yet? Martha takes us down some steps to a beach under an orange ribbon of sky. Vicki takes us up above the clouds. Becky takes us down to a pool in Kauai, steps away from the peaceful Pacific. Greg shows us a lifeguard station on a beach at sunrise. Patty shows us a snoozing boy and a mountainside under a gorgeous red sky. Hope shows us a very relaxed grandbaby, lounging in a well-supervised wading pool. Laura shows us the results of some backyard birding. Kiva gathers all the necessary elements for a good read, and unknowingly anticipates the next Round Robin topic. Seriously, while I was posting the announcement for that, she was posting this! Very nice work, everyone, and very relaxing! Thanks to all, including this week's newbies! The new Monday Photo Shoot Topic will be posted in the next half hour or so. 1. 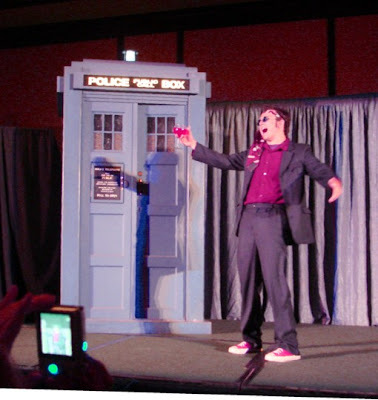 I could finally get around to writing properly about Gallifrey One, or at least part of it. 2. I could post Round Robin leftovers, the pictures of boots that I omitted because I had too many shots to use and because I chose to be extra-literal in my definition of the word shoes. Then I dawdled, and followed my incoming email, and decided to watch some Doctor Who, and it got to be after 1 AM. Boots it is, then! 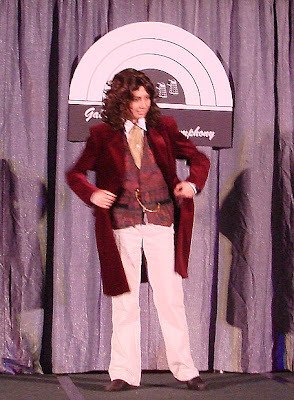 A female "Captain John" struts on stage at Gallifrey One. Barbie's 1968 friend, Talking Stacy. She's English. I guess I haven't changed this doll's clothes in a few years, because it's wearing the same outfit, boots and all, in both this 2004 blog entry and this 2005 one. 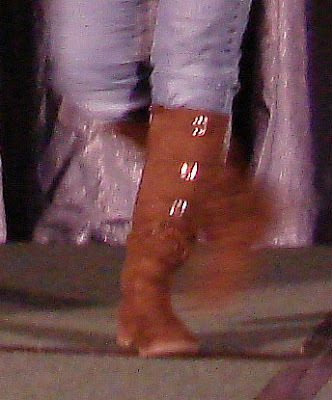 Tutti, wearing the boots from the "Puddle Jumpers" outfit. Black Rose Kate's boots, which don't fit me. Explain that away, hmm? 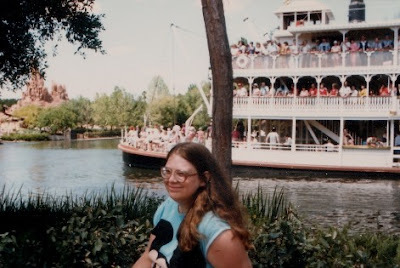 I should mention that Black Rose Kate is a time traveling pirate who occasionally visits this blog and comments on modern life. I first wrote about her on Talk Like a Pirate Day in 2005, and she turned up at my doorstep, literally, that Halloween. She doesn't like it when I call her fictional, so I won't. 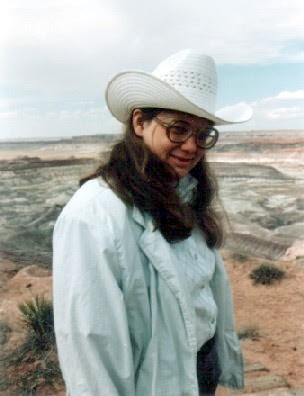 Her adventures and commentaries are collected on one of my other blogs (follow the link). No, I don't know where the other black-and-blue boot is. 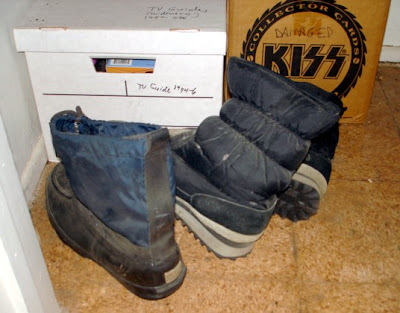 That pair was mine, and the much nicer all black "moon boots" were John's. We bought them circa 1982 at Monroeville Mall in Monroeville, PA, outside Pittburgh, after a record show. See, the only way we managed to keep open the doors of our record store, Rockarama, for about three years was by packing up the best of our imports, used records, buttons, stickers, etc. and taking them to record shows on the weekends. Our most frequent destinations were Pittsburgh (Monroeville), Cleveland, Cincinnati (Covington KY), and Detroit (various suburbs). We made the drive from Columbus to somewhere nearly every weekend, in a 1964(?) Ford Falcon van with a leaky transmission and no heat to speak of. Rust had put a big hole in the van right at my feet, where the cold winter air blew in and froze us both. That particular weekend it was something like 10 degrees with blowing snow, so we fought the cold by buying ourselves some boots. I wanted moon boots like John's, but they didn't have any left in my size, so I settled for the blue-black ones. And yes, they made for a much warmer trip home. Not much use in Tucson, though. Especially if I only have one of them! It's Round Robin time again, and for the last ten minutes I've been trying to cobble up a good pun to go with this week's topic, "Shoes," as suggested by Vicki of the blog Maraca. The previous sentence is the best one I could find to shoehorn in here. Since this paragraph is almost solely about stepping into some gags, which have already gotten rather arch, let's toe the line, shall we, before I feel like a heel! There was a cartoon many years ago by a guy named Jack Ziegler, in which a time and temperature sign on a bank announces, "TODAY'S WEATHER: SHOES." I've never actually seen the cartoon, although I could almost certainly rectify that by pulling out the CD ROM that came with my New Yorker cartoon collection book, and probably will do so shortly. But I read those three extraordinary words in a book review in Time, way back in 1979, and they've stayed with me over since. Today's weather: shoes! Glorious nonsense! 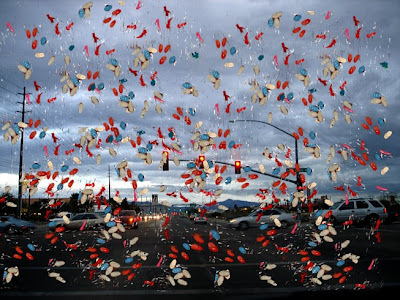 That's what's raining down on us this weekend, courtesy of Vicki and the Robins. But what shoes can I show you? 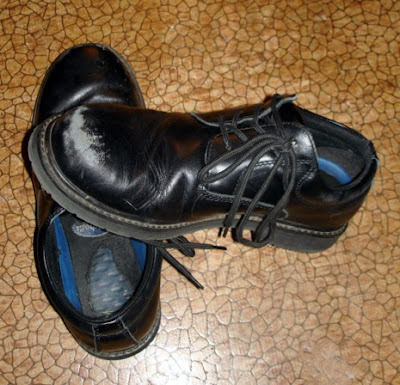 Do you really want to see the scuffed monstrosities I clop around in everyday? 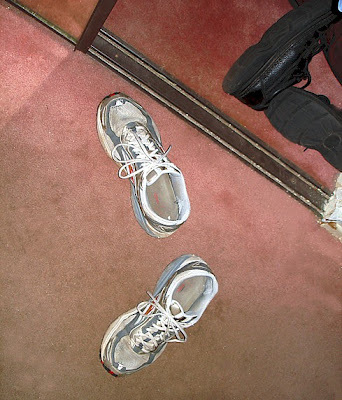 A few years back I posted pictures of the cheap athletic shoes I wore almost exclusively for five or ten years, accompanied by a long explanation about my large feet and the fact that I can only wear men's shoes in certain styles, usually in a size 10 1/2 W, because anything else leaves me with foot pain. Some anonymous idiot showed up a few days later and left a comment about my lack of style. Uh, yeah, thanks for that. Next time, read the text, buddy. Hey, it could be worse. 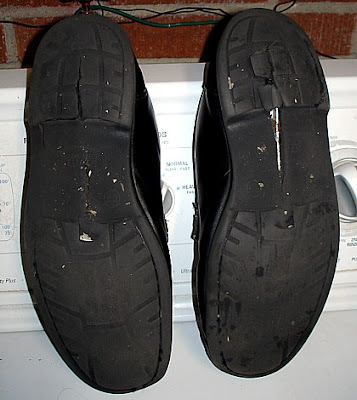 When my previous pair --laced shoes from Payless for $45, 3 times what I usually pay) died the death after two months in December 2007, the soles actually split down the middle, exposing the metal rods inside. Those were fun to walk in that day - especially when I went to lunch. It was raining. 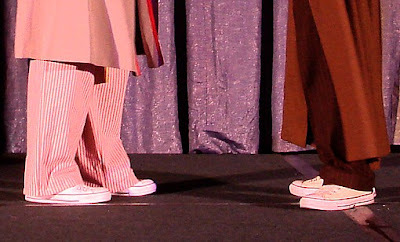 The Fifth Doctor (left) wore what were probably called sneakers, back in the day. 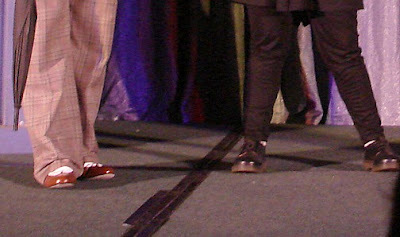 The Tenth Doctor (right), who wears this style of footwear exclusively (the better to run around and run away) calls them "trainers." He actually mentioned in a recent mini-episode for charity that his footwear was inspired by his previous self. This is not the first time the Doctor has talked about shoes, though. In the Third Doctor's very first appearance in 1970, his very first line of dialogue consisted of the word "Shoes!" Half-delirious, half scheming, he was trying to recover his shoes from the staff of the hospital where he was a patient. The reason: he'd hidden the key to his TARDIS inside one of his shoes. 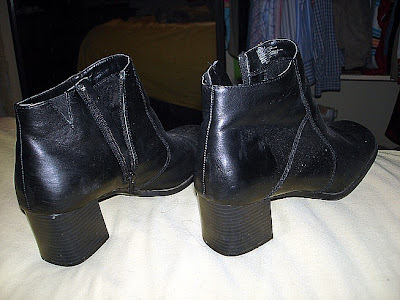 A quarter century later, the Eighth Doctor was suddenly delighted to discover that a pair of shoes Grace had given him had stretched out, and now "fit perfectly!" Let's move on to the most stylish shoes here at the Museum of the Weird. As you see above, John's shoes don't qualify, and no, Tuffy doesn't wear shoes. 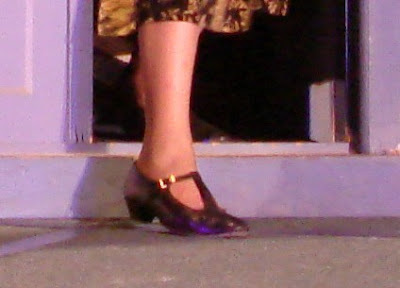 Then whose shoes are they? Well, Barbie's of course! And Skipper's, and Tutti's, and Casey's and so on. 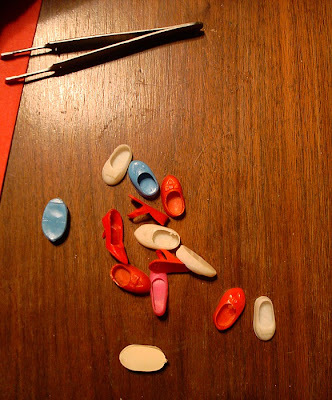 The shorter, rounder shoes in this shot are for the Remco line of "pocketbook dolls" from the 1960s, Heidi and Jan and Spunky. 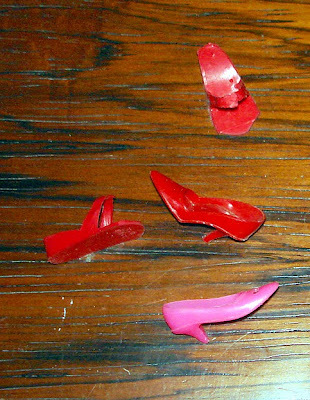 Somewhere along the line the shoes made for these dolls either got much better or much worse, and I have examples of each. Some are fairly heavy plastic, have well-defined molded bows on them, come in several colors, and fit the dolls well, if a little tightly. The others are of thin, white plastic, indistinctly molded and a little too big. Odd, that. Forty-five years, later, however, I don't suppose it matters much! 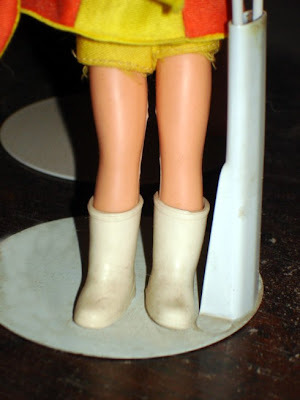 And now you know the source of the shoes in the two "Today's Weather" shots: not rain clouds, but Remco and Mattel. Now go see everyone else's photogenic shoes! Sahvvy***Welcome New Member*** - POSTED! TJ **Welcome Back TJ** - POSTED! 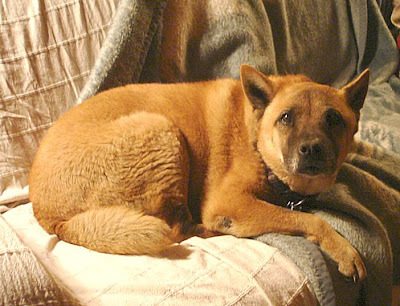 Old Dog ***Welcome New Member*** - POSTED! Celeste ***Welcome New Member*** - POSTED! Jan, AKA Wammy - ***Welcome New Member*** - POSTED! Weekend Assignment #204: Is there a year in your life to date that you remember with special fondness? When was it, and what made it so special? Extra credit: Are you likely to have an even better year in the future, or is that year simply unbeatable? Strangely enough, coming up with my own answer for this took a bit of thinking. Should I say 1977, the year that I met John at Clarion, and Harlan Ellison admitted I could write? 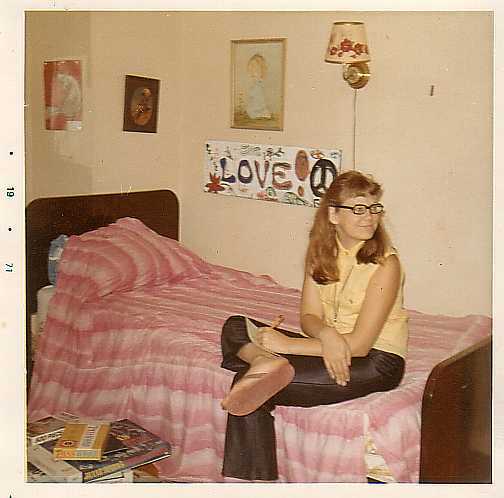 1979, when I married John and moved to Columbus? How about 1990, the first year of my adventures in California with close friends, meeting and interviewing writers, producers and actors from my two favorite tv shows? Or 1992, which was not only the beginning of the Quantum Leap cons but I think the year I had articles in Starlog? Or 2005, when I finally finished college and got my first decent-paying job as an accountant? Those were all good years, but I think I have to go with 1986. That was the year John finally came into some money from a trust fund. We put most of our worldly possessions in storage, bought a Dodge van, put our mattress on top of fake milk crates in the back of it, and drove around the country looking for someplace it wasn't winter. This was in February and March, though, so winter was pretty much unavoidable. Even most of Florida was chilly and windy. So we headed north, dropped in on my dad in Syracuse for his birthday (exactly 22 years ago yesterday - he's just turned 85) and continued on, all the way up to Montreal, which was having a winter carnival. 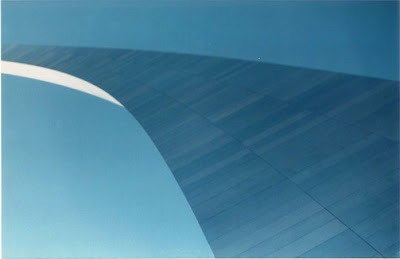 We hit a Star Trek convention in Baltimore, spent five days at Walt Disney World experimenting with different film speeds, discovered that I can't breathe in the Florida Keys due to mold, and eventually headed west, mostly following Route 66. In Arizona we visited John's sister in Phoenix and headed down to Tucson. 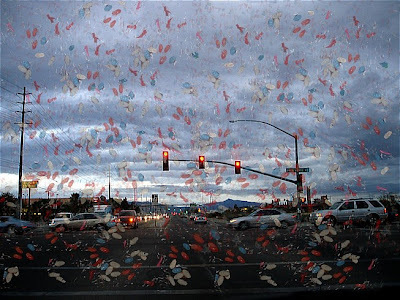 I'd never been there, and John wanted to show me Old Tucson and the Arizona-Sonora Desert Museum, both of which were located in Tucson Mountain Park. A week later we were at Gilbert Ray campground in that same country park, negotiating over the pay phone to buy our first house as homeowners. But that's not all! We had another six weeks to kill before we could move in, and our stuff was still in Columbus. So we hit the road again: out to California and then back across the country, with a second Star Trek con in St. Louis, a few hours in Hannibal and one more swing into Florida before we returned to Columbus and packed up for the moving van. Later in the year I interviewed George Maharis, Martin Milner and others for that Route 66 book that never got off the ground, went birdwatching every day to research another book I didn't write, and saw Disneyland for either the first or second time ever. Not a bad year, huh? Will any year ever top that? Hey, I live in hope. The successful publication of the Mâvarin books would just about guarantee a new favorite year for me. Your turn: What was the best year you remember? Tell us about it in your journal or blog, and come back here and leave a link. I'll write up the results a week from now, so everyone can come take a look. And, as always, a link from your entry to this one is much appreciated. Last week I offered readers a fictional $500 and an equally fictional car rental and asked you to report back about where you'd go on your fictional road trip. Now it's time to get in the car, because we're heading off in all directions! Becky, writing in comments, wants to visit the Falls: "I know my answer to this assignment, but still in too much pain to form coherent thoughts. I'd go to Niagara Falls. Last time I traveled was by mini-van. That's about it. Now to go remind John I still need him to go to CVS and fill my script for pain meds..."
Unfocused Me would take the Unfocused Family to Louisville: "We would take them to Churchill Downs, and Colonel Sanders’s grave, and whatever else there is to see, like this, but best of all would be the chance for Mrs. Unfocused and me to revisit the place where, 17 years ago, we decided we had to make things work, and set the foundation our marriage four years later. And to get another Churchill Downs Kentucky Derby mint julep glass to replace the one Unfocused Junior broke a couple of years ago." Saqib sends us on a virtual tour of Karachi: "A popular destination is Park Towers. It's a trendsetting shopping mall overlooking the Arabian Sea. People come from all over to shop here. If you are looking to buy fashionable Pakistani clothing, check out Adnan Amir, a trendy botique located inside of the mall. Be prepared to shell out Rs. 4,000 for a stylish new Kurta." Mike would take the family to Wisconsin Dells: "It's a relatively pain free drive from the Chicago area, and the kids would have fun. I was looking at the web site just now; it is a lot different than when I was a kid." Duane would head for Florida, most likely Daytona Beach: "Yes, that's right, Daytona Beach, Florida, for Speedweeks and the 500. Of course, without tickets and reservations made months and months in advance, I probably would have been reduced to begging scalpers for a deal and sleeping in my car or camping out in the infield for days. And it would have been heaven." Florinda is up for a drive to Carmel and Monterey: "I'd like to make most of the drive along the coastal route, which means I probably won't get there very quickly, but I'll be able to make minor detours along the way to places like Pismo Beach, Morro Bay, and San Luis Obispo. I'd also like to bring Gypsy along for the ride; according to The Dog Lover's Companion to California, Carmel may be one of the most dog-friendly places in the state." Kiva came up with a late addition and didn't tell me: "If I had the time, I'd just start driving and see where the road takes me. I'm the type that wonders, "well, where does that road go?" and I follow it." The conclusion to be drawn here is that there are cool destinations within reasonable driving distance of pretty much anywhere people live. Good thing, too, because we all need to get away once in a while. Thanks, folks! The new Weekend Assignment will follow shortly. 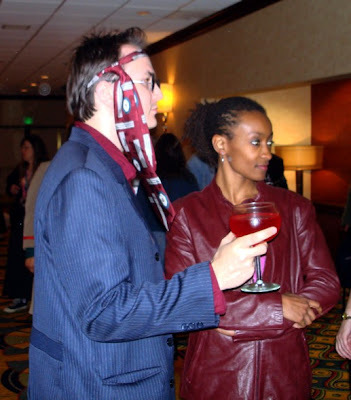 As you know, Ace, (that's an exposition joke) the plan tonight was to get through a bunch more of my writeup of the Gallifrey One convention, on the grounds that I no longer have a fanzine in which to publish such things. 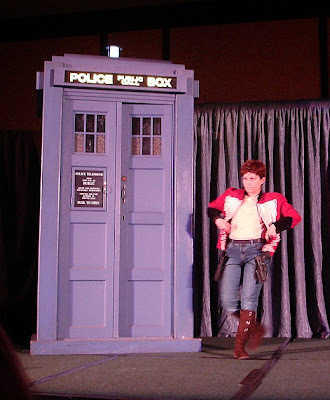 I figure the text should be of interest to Doctor Who fans, and the costume photos may be of interest to a slightly wider audience, 'cause costumes are fun even if you're not familiar with the characters depicted. Three shots of the moon as it started to be eclipsed. More and more, however, I find that my brain very seldom does what it's told, at least not when it comes to allocation of leisure time activities. As of 11 PM, I had yet to edit a single photo tonight to accompany this entry. 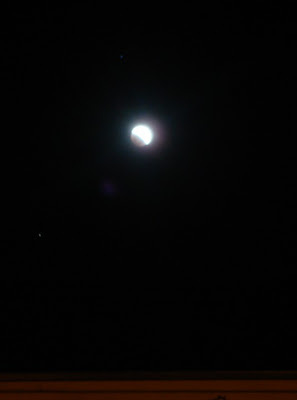 Worse, I failed to go back outside after 8 PM to catch the lunar eclipse at its eclipsiest. Drat! I just plain forgot about it. I do that a lot, I'm sorry to say. Forgetting to do stuff, that is. Moon over Speedway - but which light is it? Am I suffering from the beginning of Alzheimer's, three weeks shy of my 51st birthday? Have I a touch of dementia, brought on by a TIA or two or three? No, and no. And no. (That's a King Jor joke; don't worry about it.) Am I cognitively impaired due to sleep deprivation? Again no...well, maybe a little, occasionally. 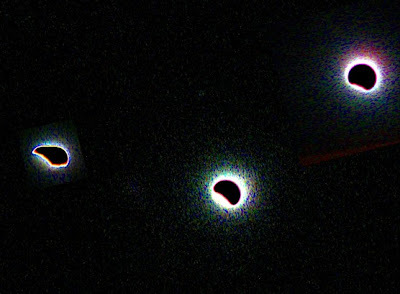 Solarization applied to the aggregated moon shot. No, all this has to do with distraction. Whatever it is I'm supposed to be thinking about or doing, more often than not my brain decides that now is the perfect time to obsess about something else entirely. So what have I been doing tonight instead of editing photos, writing my "con report," working on my RR database or taking bad photos of the moon after 7:20 PM? Was I indulging my Wikipedia addition, watching DVDs, or reading the Doctor Who Forum, perhaps? Not to any significant degree, no. I haven't made a single Wikiedit today, watched only one House episode, and have only read new posts in a few DWF threads. The main thing I've been working on tonight - and this is the good news - is my Heirs of Mâvarin edit, and updating that darn outline. 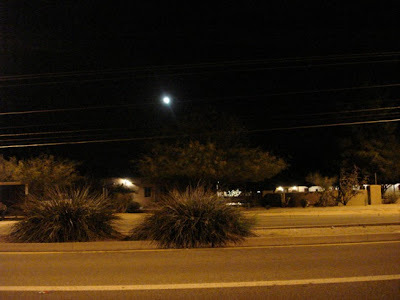 The moon over St. Michael's tonight looked like a comet. What happened is this: I thought I had chosen the right timing for that one problematic scene I wrote about a week or two ago. I went back through Chapter Eight, changed a few sentences so that Jamek arrived in the morning instead of the late afternoon, and revised several other passages while I was at it. When I was done, I updated my word count spreadsheet and immediately started on Chapter Nine. My best one. Several of Scalzi's readers got great shots. Turns out, the first scene in Chapter Nine makes no sense at all if Jamek arrives on Mâsheldu morning. Jamek has to remember the camped tengremen soon enough after arriving to be plausible. He then has to go see if they're still there, come back, and be sent to find Albi, who has to be far enough away by then to arrive only in the nick of time. I don't expect you to follow all that, but the point is that the timing is critical to making this whole section of the book work. And the more I looked, the more I saw problems, and realized a quick fix wasn't going to resolve them. I've often thought that a board game, or possibly tokens on a giant map, would be the best way to figure out which characters should be where, doing what, on any given morning, afternoon or evening. But I've tried it, and it doesn't work any better than outlines, index cards or counting it out in my head, which is to say, not very well. So instead I'm falling back on that outline, updating it chapter by chapter. I'm up to Chapter Three - or was, before I got distracted again an hour ago after I started this entry, first designing a Mâvarin game board and then editing eclipse pictures. With the Gallifrey stuff still to do, photos to edit, the Weekend Assignment and Round Robin coming up, well, it could be a while before I get the timing of scenes in Chapters Eight and Nine straightened out. 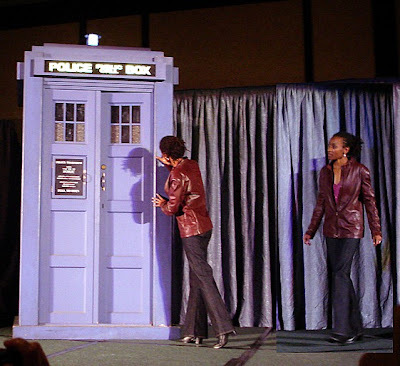 I was going to write about Gallifrey One tonight, with a more general and factual perspective than my Friday night misadventure entry or my Saturday night introspection. I can't, though, because two or three hours of editing photos has left me no time to write actual words. I'll get to it, though. 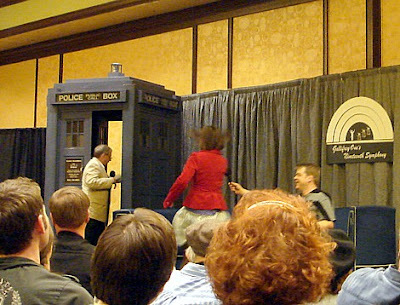 Sylvester McCoy (who played the Seventh Doctor) emerges from the TARDIS as Sophie Aldred (who played his friend Ace) rushes to follow up on Sylvester's shtick. 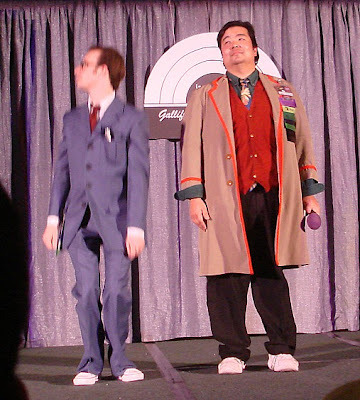 Shaun Lyon, the emcee and public face of Gallifrey One, looks on in amusement, having just introduced Sophie. Sylvester and Sophie put their feet up as writer-editor Gary Russell asks them a series of numbered questions. Sophie wants to know whether it's a game show. 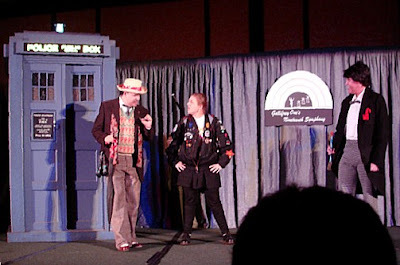 Skipping over Opening Ceremonies, here are some shots from the Masque of Mandragora, the con's costume contest. 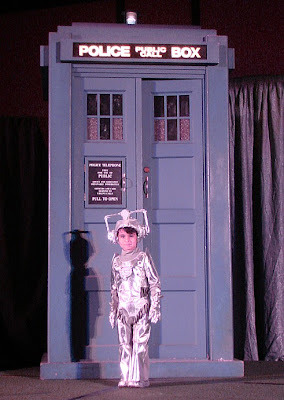 Here is the littlest Cyberman, or Cyberboy. 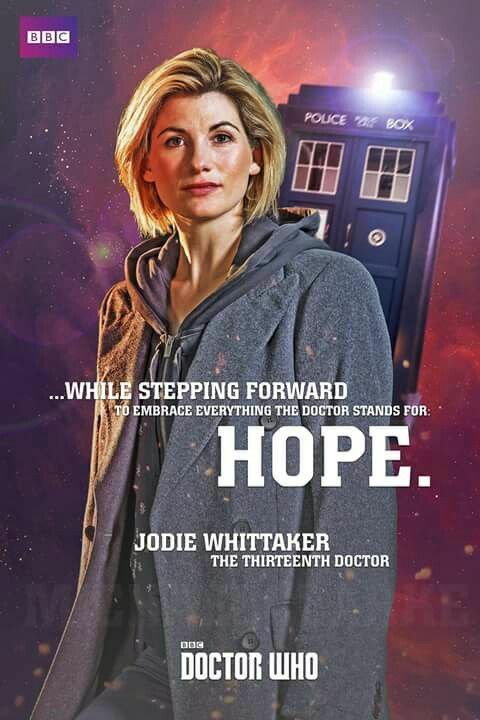 The premise is that like Ianto's former girlfriend in the Torchwood episode "Cyberwoman," the Cyberboy wasn't completely transformed when the Cybermen got him. The following evening, this little boy and his equally tiny sister were rolling around in the hallway as orange-suited Luke and white-hooded Leia from Star Wars. The supposedly drunk Doctor from Moffat's "The Girl in the Fireplace" sings "I Could Have Danced All Night," praises bananas and insults the audience. Harold Saxon, the mad, murderous Prime Minister, turns his laser screwdriver on us. Harry Saxon's deranged wife Lucy pouts prettily in her handmade satin "moll" dress. The Seventh Doctor introduces Ace to the Second Doctor in a brief sketch, which references a Dead Ringers comedy bit about the Second Doctor's foes being "made of tin foil." Over a decade later, fans are still upset that the Eighth Doctor claimed to be half human. How much bigger would the firestorm have been had the Eighth Doctor been female? Another female portrayal of a male character: Captain Jack's old flame Captain John, played on tv by Buffy's James Marsters. More tomorrow. With words, even! 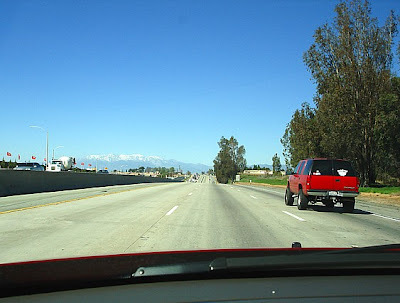 Weekend Assignment #203: Road Trip! Neez. Piano. And Other Expressions of Grief. But I Have No Cat to Vacuum! Is It a Sin to Eat Steamed Sparrowgrass?